a historian of science, a data enthusiast, and a juggler. If you’re looking for the blog, click here. You can occasionally find me on twitter or google+, less frequently on facebook or flickr, and I’ve got an account on linkedin that never gets updated. If you want to contact me, your best bet is via email. If you like science and history and digital humanities and funny things and philosophical things, you might like to subscribe to my curated feed, where I republish my favorite posts from over 500 blogs. You can see what scholarly articles I read at my Zotero shared library. In my spare time I work at the Cyberinfrastructure for Network Science center. Sometimes you can find me at Indiana University in Bloomington, Indiana, although I’m usually off on some adventure. The blog is dedicated to most of the stuff I love: digital humanities, history, science, data, and networks. My other passion is juggling, but I enjoy doing that more than I enjoy writing about it. I’ve spent the last four years (as of May 2014) working toward an informatics Ph.D. with a focus on history of science, and I suspect I have another year or so to go. As my dissertation looms closer, this blog will likely focus more on that work in particular, which will explore how communication structures have affected scientific research over the last thousand years or so. For now, I’m enjoying writing about the methodological difficulties and promises of studying history and science in a digital world. This is a word cloud from every scholarly article I’ve ever read. Yes, word clouds are evil, but you know more about me now, don’t you? How do changes in communication structures and technologies affect scientific discourse and collaboration? Science is totally rad. So I study it. There are all sorts of ways to study science, of course, and you can’t leave out even one if you want to understand Science as a whole. That means taking a look at its philosophy, history, anthropology, culture and all sorts of other things as well (perhaps even sociology!). It also means looking at the science itself, because no scholar should claim to understand physics and physicists without being able to calculate the distance the bullet travels before it falls. My overarching research is in modeling and mapping the growth of science on a large scale – thematically, geographically, temporally – hoping to reveal what are the most fruitful for discovery and innovation. Looking back, we see times when scientific progress lurches forward at alarming rates, times when studies come to a halt, times when great minds exposit to deaf ears. Sometimes the reasons are obvious: burned libraries, overthrown empires, new sources of funding, technological breakthroughs, wars that need winning. But these are heavy brush-strokes painted across the canvas of history. If we could somehow view the whole of scholarly endeavors for the last thousand years, across every topic and in every city, with the same fine granularity used to research history or modern-day science, imagine how much we could learn. By zooming out and looking for “hot spots” of innovation in the history of science, and by understanding the environment in which these hot spots formed, we can learn to induce those same ideal conditions in modern day research. If the synthesis of new ideas in physics tends to come from young researchers working on their own and with backgrounds in other fields, funds can be allotted to make sure more of those exist. If medical innovations come fastest when small groups of experts collaborate, or if science in general runs smoother in small-world type collaborative networks rather than completely connected networks, that information can be used to focus science policy in just the right way to improve the rate of innovation. The closest we can come to that fine granularity, to understanding science across contexts, is by using every research tool available to us. We must be comfortable working in whatever discipline with whatever methodology is necessary to find the answers sought. Huge historical data sets will be a must. Scientometricians and others in related fields do an amazing job of learning the structure of modern science, but that structure is necessarily bound to the mediums it inhabits. Modern science is a beast of national laboratories, e-mails, universities, cited journals, click-throughs, conferences and page hits. Marshall McLuhan may or may not have been correct when he claimed “the medium is the message,” but there is no doubt that the medium plays a large role in how science is adopted, disseminated and studied. That role cannot be understood without stepping back and viewing all of the alternatives – correspondences, scientific societies, book transcriptions, etc. The task, then, is to collect as much data as possible, as far back as we can. We should track where books traveled within Medieval Europe and Asia; who corresponded with whom, how often, and about what during the Early Modern period; who taught whom and where scientists studied; how many books were published in what languages; what universities had copies of which journals; where shared resources traveled. This is an impossible amount of data, of course, and can only exist if created collaboratively and in the spirit of openness. These are not ideas to be copyrighted – they are numbers and data points, and they should be accessible and compatible and aggregated in one place. A History of Science Data Commons, so to speak. More on that project coming soon. Periods of rapid scientific production and progress. Inflection periods in scientific communication and collaboration. Changes in communication structures and technologies obviously affect scientific progress deeply, and it is exactly what those effects are that I hope to uncover. I currently split my time between personal research, courses, contract work, and CNS, a center run by my absolutely fantastic advisor Katy Börner. A generous fellowship from the government has allowed me the freedom to work on pretty much whatever I want, which in practice is not much different than what I worked on before the fellowship. Mostly I publish papers, help in the development and documentation of data analysis software (like the Sci2 Tool), write code, and present at conferences. Most of my contract work is related to the Republic of Letters, and I’ve been lucky enough to work with the CKCC in the Netherlands, CofK at Oxford, and the Mapping the Republic of Letters team at Stanford. I’ve taught a bunch of humanities workshops relating to text and network analysis; I’ve taught information visualization, history of science, and introductions to the digital humanities. My undergraduate training at the University of Florida was split between computer engineering and history of science (under the inimitable Robert A. Hatch). Courtney and I contact juggling. Thankfully for my friends and family I do not work 24/7. When not working, I can found juggling, attending concerts and re-enactment festivals, geocaching, camping, reading sci-fi/fantasy, and generally adventuring. If I feel guilty about not working, but not enough to actually get back to work, I read about physics, cognitive science and linguistics. 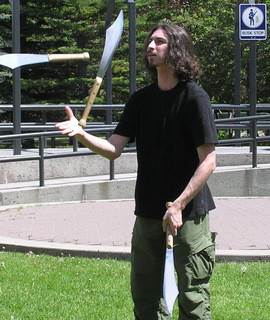 I am also perpetually writing a history of the obscure art of contact juggling. Juggling has been a big part of my life for a decade now; I was president of Objects in Motion (UF Juggling Club) for a few years and brought the club from 3 to 30 active members, taught lessons at Groovolution dance studio, and performed with Spherocity in Gainesville and Circle & Spice in Bloomington. I’m now involved in the IU Juggling Club, juggle irregularly at the Bloomington Farmer’s Market, and perform with and help choreograph for The Hudsucker Posse. I have performed as far north as Alaska, as far east as Israel, as far west as Los Angeles, all the way south in Miami, and all sorts of places in between. None of that would have been possible without my good friends and co-performers in the Spherocity contact juggling troupe: Matt, Jay, Cory, Courtney, Steve, and Leighanna. Thanks to Nick, Nicole, Leah, Ian and the rest of the crew, Objects in Motion keeps growing larger and better and I miss them terribly. I should also mention two now-defunct but entirely formative pseudo-academic organizations I’ve been involved with. I co-founded Sophosessions with Warren C. Moore, the coolest cat around, in my junior year at UF. The group still allowed its two-dozen members to present talks on whatever they felt like, from Chinese calligraphy to Zen Buddhism to advanced fractal mathematics to building robots. Then everyone went to Ben & Jerry’s. The Venerable IU Beer & Algorithms Club filled two Monday nights a month when I first moved to Bloomington, and I got to listen to a bunch of Computer Science and Math graduates present their favorite algorithms in gory detail, all while eating a tasty meal and enjoying an equally tasty beverage. What could be better? How did you get a word cloud of EVERY scholarly article you’ve ever read? I mean, I know how to make word clouds, but I’m curious about how you are storing the text of all those articles! Wow, this word cloud is very out of date. At any rate, it’s not the full text of all the articles, it’s only title and abstract text. I use Zotero to keep track of what I read, and then I exported all the bibliographic records to *.bibtex, loaded the file in the sci2 tool to separate out the fields I wanted, did some word counting and cleaning in excel, and then fed the resulting word list to wordle. Not super simple, but not outrageously difficult, either. Ah! Ok that makes sense. Not as difficult or crazy as I expected!